There’s a lot to be excited about at the Denver Art Museum this year. Outside of their various collection, the museum is displaying some incredibly unique exhibits that span numerous cultures and creative outlets. Just a light rail ride away from the Englewood apartments for rent, here’s a brief look at what visitors can expect to see. Featuring over 100 photographs of contemporary landscapes, New Territory stretches the boundaries of this artform. The exhibit is meant to reflect environmental attitudes, perceptions, and values of in the modern age. The images are takes using historic photographic processes combined with innovative techniques and unconventional equipment. Together, the 40 artists have utilized this blend of processes to “blur the distinction between observed and constructed imagery.” Ultimately, the exhibit challenges viewers to see the art of photography in a different light while offering a reflective view into humankind’s relationships with Earth’s landscapes. Like a Hammer is artist Jeffery Gibson’s first major museum exhibition. It features his unique blend of contemporary practices and love for his Native American heritage. The exhibit holds 57 objects created over the course of seven years, mixing mediums form video to painted rawhide. Drawing from Choctaw and Cherokee roots, the works display striking patterns with text from various poems and song lyrics. Touches from Gibson’s time spent in subculture circles, living abroad, and interest in pop culture are also evident. The exhibit shines a light on post-colonial civil rights movements, but ultimately conveys messages love, community, and survival. This complex and incredibly creative exhibit by Gibson will remain on display in the Denver area until September 8th before making its way to Seattle. This exhibit is a celebration of animals in art. 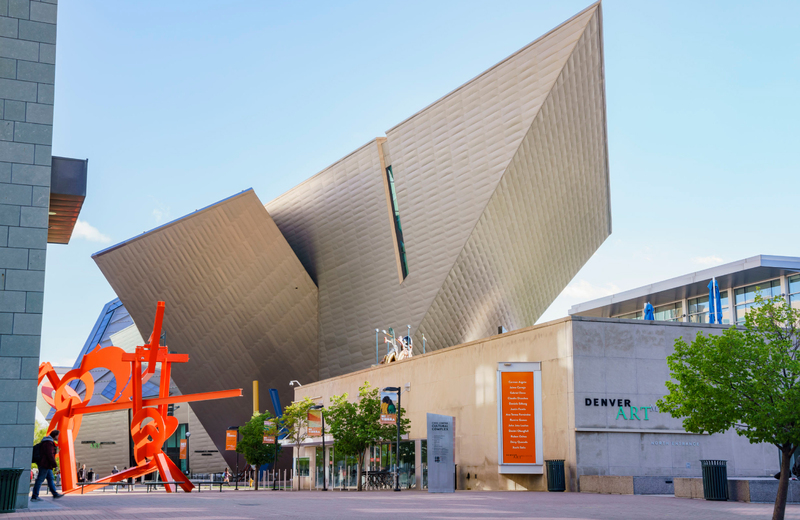 Over 300 objects have been compiled from various departments in the Denver Art Museum to explore how animals have inspired artists through the centuries and around the world. Stampede invites visitors to reflect on the relationship between humankind and animals. Themes range from how animals have been used to convey stories and ideas to how artists have used animal materials in their work. Visitors can find favorites like Deborah Butterfield’s horse sculptures alongside rarely seen pieces from the museum’s collection. The exhibit also features a hands-on section where visitors can draw an animal themselves, as well as an interactive section that focuses on the processes used to create Never Alone (a video game created by Native North Alaskan storytellers). At the end of the exhibit, you can even enter the 3-D studio for more hands-on creative opportunities. Eyes On focuses on the work of Julie Buffalohead, a Minnesota-based artist and citizen of the Ponca Tribe of Oklahoma. Julie is well known for working in a variety of mediums, but this exhibit will highlight a new set of canvas paintings designed around her life experiences and her tribe’s ancestral knowledge. Julie also uses animals as a vehicle to explore ideas and concepts, making this an excellent pairing with Stampede. Her artwork focuses heavily on storytelling, often describing emotional experiences in American Indian culture as well as its commercialization. This exhibition is also a two-part presentation that Julie will share with Shimabuku, a Japan-based artist who works in video. His film Do Snow Monkeys Remember Snow Mountains? will be on display as part of Eyes On with Julie’s work until January 20th of 2019. Back by popular demand, La Musidora is located outside of the museum’s Hamilton Building entrance once again. The installation features a long line of unique lounge chairs with colorfully woven patterns. As you sit down, rocking back and forth will cause your chair to make musical sounds. Up to 20 people can rock in tandem to create music on this 90-foot installation. This interactive installation is the work of local Denver artist Jaime Molina. It features an immersive collection of paintings and 3-D objects, offering an immersive experience inspired by the joy of discovery. Visitors can sit inside of boxes with painted faces, sit on a hand-chair, and play in a cacti garden. This installation will be added to as Molina works to paint different sections throughout the year. The Denver Art Museum and National Museum of Cambodia in Phnom Penh have collaborated with one another to create this collection of artwork surrounding the Hindu god Ganesha. The centerpiece of this exhibit is a stature created sometime during the 600’s and 700’s, known to be one of the earliest representations of the deity. Other sculptures, paintings, and textiles depicting Ganesha surround this ancient centerpiece. The exhibit combines works from all over the Asian subcontinent, showcasing the iconic changes made to the deity’s appearance over time. It’s a unique insight into a single aspect of Hindu religion. Tickets for the Denver Art Museum can be purchased online via this link. Members can take advantage of free general admission as well as various other benefits associated with different tiers. General admission is also free on the first Saturday of each month, courtesy of the SCFD and Your 6 Hometown Toyota Stores. Anyone age 18 or younger has free access to the museum. Just a light rail ride away from the museum rests The Palmer, the South Corridor’s newest premier destination. This community of apartment dwellings provide the finest in modern furnishing, a host of carefully curated amenities that cater to Denverite lifestyles, and easy access to The Inverness Business Park as well as the DTC area. From recreational opportunities to fine dining destinations and a bustling economy, the city boasts a progressive yet wholesome appeal. We invite you to experience the vibrant culture of Englewood from the comforts of luxury living. Welcome to a redefined sense of city living. Welcome to The Palmer.